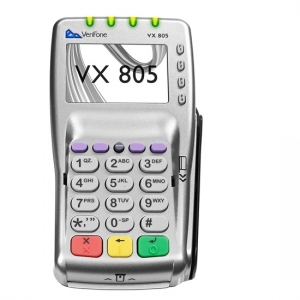 VeriFone’s VX 805 PIN Pad provides precisely what you need, and nothing you don’t. Enjoy ease of use, solid reliability and the features required for quick payment processing. This sleek device contains everything to start taking EMV and NFC payments, and is powerful enough to meet merchants’ future requirements. The VX 805 packs power, performance and future-proof payment capabilities all in one compact solution. Minimize errors with the VX 805’s intuitive ATM-style interface, large keypad and a high-resolution white backlit display. Enjoy fingertip convenience and ease of use with simple and efficient processing of credit, PIN-based debit and other transactions – including EMV-based chip cards. Finally, a payment device that is both compact and stylish. This remarkably sleek device can easily be handed to consumers or mounted on a countertop stand. Although small in size, the VX 805 still provides a powerful performance. A lightning-fast processor makes quick work of even the most complex needs. Relax knowing that the VX 805 has been certified with the latest PCI PTS 3.X security protections and is ready for the future. EMV Level 1 and 2 type approved. Secure PIN entry protects smart card transactions. Exceptionally reliable vertical magnetic stripe reader and well positioned smart card slot reduce read errors. Feel safe knowing the device incorporates both end-to-end encryption and sophisticated file authentication.